Most Côte St. Luc council members have confirmed they will be seeking re-election in this year’s municipal vote, taking place in November. A few council members were not available at press time. Those who confirmed they will run again include District 2’s Mike Cohen, District 3’s Dida Berku, District 4’s Steven Erdelyi, District 5’s Allan Levine, District 6’s Glenn Nashen, District 7’s Sidney Benizri and District 8’s Ruth Kovac. Berku says she still has much to contribute, including to the Meadowbrook Golf Course legal case, in which Groupe Pacific is still suing the city for its rezoning of the site from residential to recreational in 2001; the quest for the long-awaited Cavendish extension; her work on committees of the island-wide agglomeration; and on the Centre West economic development board. “I will not plan my retirement until Meadowbrook and Cavendish are resolved,” Berku added. “It has been a pleasure serving the residents of my district and I hope to have the opportunity to continue to represent them for another four years,” Erdelyi said. Nashen says he wants to continue in his efforts to improve safety and the quality of life in Côte St. Luc. He plans to expand the services of the volunteer Citizens on Patrol, push for the electrification of the municipal vehicle fleet group and continue to lobby for bilingual road signs, messaging and publicity throughout Quebec, especially those involving safety. He is also developing the Côte St. Luc Historical Society. Benizri won a by-election last year. Update: All Hampstead council members, including Mayor William Steinberg, say they intend to run for re-election this year. More details next week. The Suburban will provide further updates on the electoral intentions of council members in Côte St. Luc and other municipalities. As my term as Acting Mayor of Cote Saint-Luc drew to a close I sat down to ponder this unique experience. Cote Saint-Luc follows a tradition typical in many municipalities by having each of its councillors alternate as Acting Mayor should the duly elected mayor be unable to fulfill his or her functions. 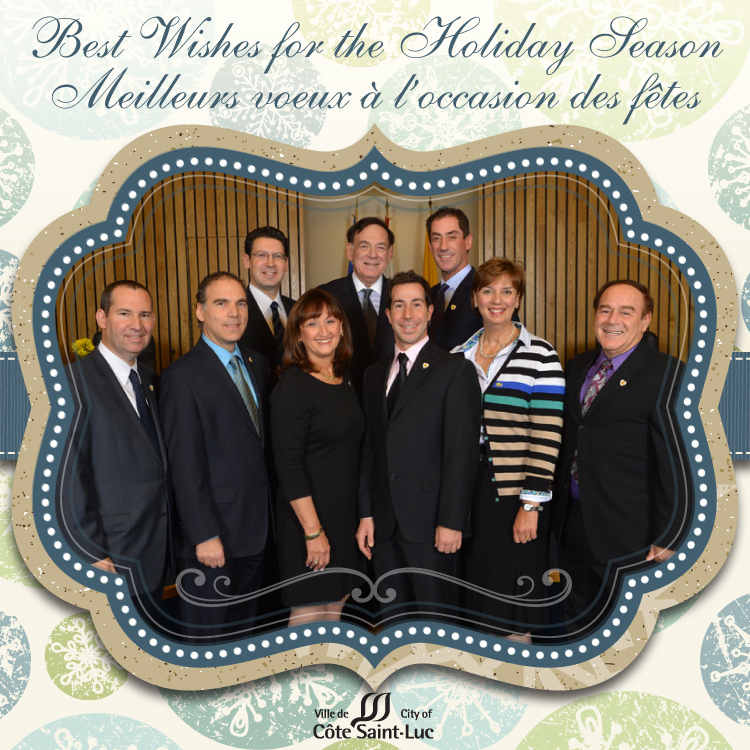 My latest turn in the eight-person rotation covered the last three months of 2015 so with the resignation of Mayor Anthony Housefather on November 4, 2015 subsequent to his election as Member of Parliament for Mount Royal I immediately and seamlessly assumed the role of Mayor of the City of Cote Saint-Luc. What a time of year to take over! We went straight into intensive planning for the next year’s budget which has ramifications for all residents and taxpayers, for employees and contractors. Presiding over such meetings is no easy feat as passions flare, opinions clash and nerves get frayed. Thankfully, our City Council functions quite harmoniously. In planning for the $67 million budget and much more in the triennial capital expenditures we needed to consider services to residents, infrastructure upgrade and maintenance, staffing, fleet acquisition, service contracts for snow clearing to name some of the major issues. There was also the little matter of requesting a ministerial extension on the prescribed election period in order to allow enough time for the majority of our snowbirds to be back home in time to vote for our next mayor. Dealing with human resource issues is never an easy topic. With personnel expenses reaching 70% of our operating budget it’s not possible to look at trimming budgets in difficult years without affecting staff. This was the sad reality that we had to confront. Decisions were made based upon business plans and economic factors despite the inevitable emotional tone. I dealt with many emails and inquiries on the change in library opening hours and wrote an opinion piece that was published in the Suburban Newspaper. Several emails praised the city for its superb handling of the first snow storm of the season. I was updated on two late night major house fires as well as an early morning bank robbery with suspects at large. A ride up in the city’s “cherry-picker” to light the Chanukah Menorah and greeting residents in four languages was quite special. I also attended a Russian holiday festivity and caroled outdoors to welcome Christmas while lighting the tree in front of City Hall. Back inside I presided over several public meetings, keeping decorum, steering the agenda and fielding questions from the public and media. Most inquiries were rather pleasant and positive. Unfortunately, some were downright aggressive and nasty. I presented the Annual Report of the Mayor, a lengthy speech about the city’s performance over the past year and predictions of financial intentions and plans for the next year. The “In-Committee” meetings go on for hours and hours, usually to midnight, sometimes beyond. All this takes place after hours, as mayors and councillors in all but the largest cities typically have careers that are the mainstay of their livelihood. So, for those of us with families, young children and responsibilities at home this means lots and lots of time away. I cannot thank my wife, Judy, enough for constantly supporting my political activity and managing an extremely busy household alongside her own 24/7 practice. My children, Jeremy, Nathalie and Nicole are usually rather forgiving having experienced (since birth) that daddy is constantly checking emails, taking calls and out at meetings and events, missing dinner, playtime and unfortunately some special moments. This harrowing routine continues late into the night and into the weekends. It follows you on vacation. It’s never-ending. On the whole, serving as Acting Mayor has been an immense privilege and honour, an experience that was both personally and professionally rewarding. Thank you Allan, Dida, Mike, Mitch, Steven, Ruth, Sam, Nadia and Anthony too! Although it only lasted eight weeks I must say it was one of the most interesting periods in my 25 years since being elected. The demands are unending and thanks to the support of council and a truly dedicated administration the job is manageable and incredibly interesting. I pass the torch to Councillor Dida Berku for the next three months. Council and management will continue to be there to back her up and keep the city on course until the elections when we choose our next mayor. And thanks to all of you who wrote, called, asked questions and engaged your elected representatives in the best interest of our wonderful city. Thank you for this wonderful opportunity. I look forward to getting this chance again some day, preferably not by accident. Suburban, Jan. 30, 2014. Click to enlarge. In a “cabinet shake up” announced tonight by Mayor Anthony Housefather my responsibility as the de- facto councillor for public safety will change for the first time in more than 20 years. For the next four-year mandate my portfolio duties will include Public Affairs, Communications and Information Technologies. Additionally, the mayor has asked me to continue heading up the Emergency Preparedness dossier and to continue overseeing the volunteer Citizens on Patrol division that I created in 2006. My passion for the all volunteer Emergency Medical Services launched my political career 25 years ago and my keen interest in promoting and advancing this unique life-saving service has never wavered. I will continue to serve as an active member of the Public Safety committee and push EMS forward. I am looking forward to working on many improvement ideas to enable the city to better communicate with its residents and for residents to easily and efficiently find information from all city services. We need to develop mobile apps to better meet the needs of our residents and to adopt online practices to share data and information. Furthermore I am very excited to retain responsibility for Emergency Preparedness and vCOP. 2014 will see a major push forward in preparedness and I look forward to engaging residents in readying themselves for the possibility of disaster, large or small. As well, I continue to invest significant energy and hours with the leadership of vCOP in developing policy and programs, in augmenting their training and capacity to serve and protect our community in conjunction with our excellent public security department and local police station 9. Mayor Housfather will retain responsibility for the Agglomeration Council, Legal Affairs, Purchasing, Human Resources, Inter-governmental Affairs and take on Inter-cultural and Intercommunity Relations. Councillor Steven Erdelyi will assume responsibility for Finance and will continue to work on the Environment. Councillor Dida Berku will assume responsibility for Public Works and Railway Relations, co-chair Environmental issues with Erdelyi and retain responsibility for the Cavendish Boulevard extension. Councillor Mike Cohen will assume responsibility for Library and Culture while retaining Sponsorship and expanding his role from the Côte Saint-Luc Cats Committee to Animal Protection. 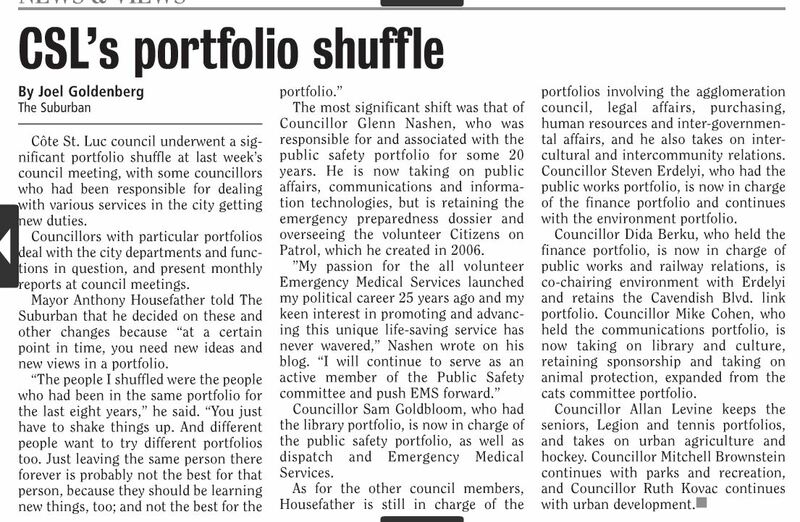 Councillor Sam Goldbloom will assume responsibility for Public Security, Dispatch and EMS . Councillor Allan J. Levine will retain responsibility for Seniors, the Legion and Tennis while adding Urban Agriculture and Hockey. Councillor Mitchell Brownstein will continue to oversee Parks and Recreation. Councillor Ruth Kovac will continue to oversee Urban Development (Engineering and Urban Planning). A lively debate occurred after it was announced that Côte St. Luc would have to pay back the City of Montreal for their 2001 deficit of about $2.7 million. During the demerger, many of the separating municipalities demanded that their financial surpluses which were absorbed into the mega-city in 2001, be paid back. At that time, Côte St. Luc was the only town running a deficit. Montreal agreed to pay back the cities their surpluses. It should then only be fair that Côte St. Luc pay back their deficit. Resident Irving Itman took exception to the idea that Côte St. Luc would let such a large debt go unpaid. Mayor Housefather and councillor Dida Berku tried for about 10 minutes to convince Itman that this was a hidden cost that only came out recently. “No one ever told us, ‘you have to pay back 2.7 million dollars.’ Not once,” said councillor Berku. Those in attendance also witnessed a bit of democratic sparring over item 8a on the agenda: an amendment to Bylaw 626. The existing bylaw states that homes of a certain value, built after 1997, had to install sprinkler systems. The amendment would provide an exception which allowed homes more than 50 per cent destroyed by fire, and initially built before 1997, to not have to install a sprinkler system during reconstruction. “I think it’s very poor logic to, pardon the pun, water down the existing bylaws by exempting the installation of water sprinklers,” said councillor Glenn Nashen. “The insurance covers the rebuilding of the home without the sprinkler system because there was no sprinkler system when it burned down. So we would be be requiring individuals with a modest home to incur the extreme expense,” countered councillor Mitchell Brownstein. The amendment was passed by a vote of five to three. Among the new appointments was local resident Ken Lerner, who was given the nod to become Côte St. Luc’s new Division Chief of Purchasing. It was also announced that late last week, Emergency Medical Services Director, Richard Elderstein resigned from his position. After certain details are finalized, the job will be open for application by the public.